I am far from a coffee aficionado. I am, however, married to a closet coffee snob. While I am content with good ol’ drip coffee, my husband has a plethora of coffee tools and gadgets, including a stovetop Italian espresso maker, an Aeropress, a Chemex coffee maker, two French presses, and a burr grinder. Oh, and we have a standard drip coffee maker. My husband also loves to roast his own coffee, but that’s another subject. I do savor my one cup of coffee in the morning (with half and half, please, and thank you very much), but that is typically the extent of my caffeinated fueling for the day. It is, however, difficult for me to say no if someone offers me a cappuccino. My primary complaint about coffee is that it can be bitter, so I was hoping Alton’s coffee method would succeed in rendering coffee free of bitterness. This post will be rather brief, as the 20th episode of Good Eats featured a method of coffee making, more so than a recipe. To make coffee the Alton Brown way, grind your own beans, and grind them as close to brewing time as possible. For drip coffee, Alton recommends that you grind your beans for about 15 seconds, and he says a standard blade grinder is just fine. 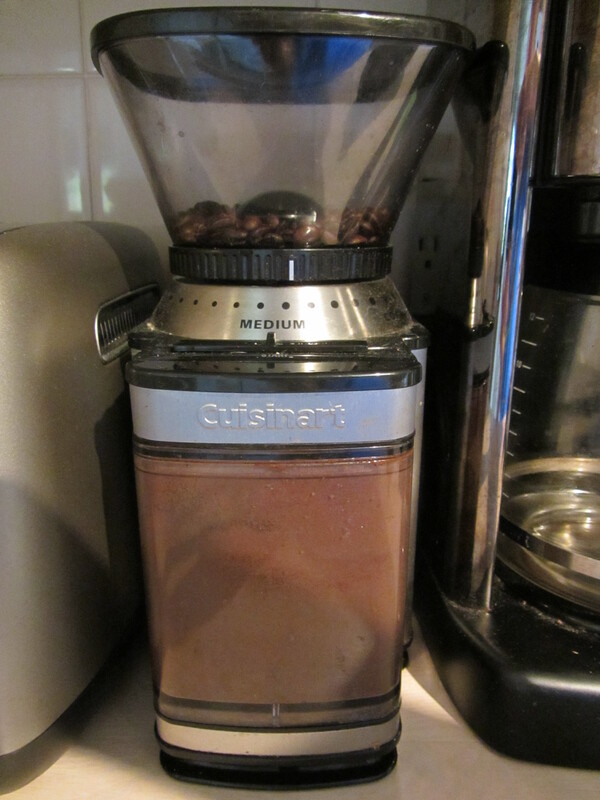 Since we happen to have a fancy schmancy burr grinder, I used that to grind my beans just prior to brewing. Alton strongly emphasizes that it is critical to use enough coffee when brewing. 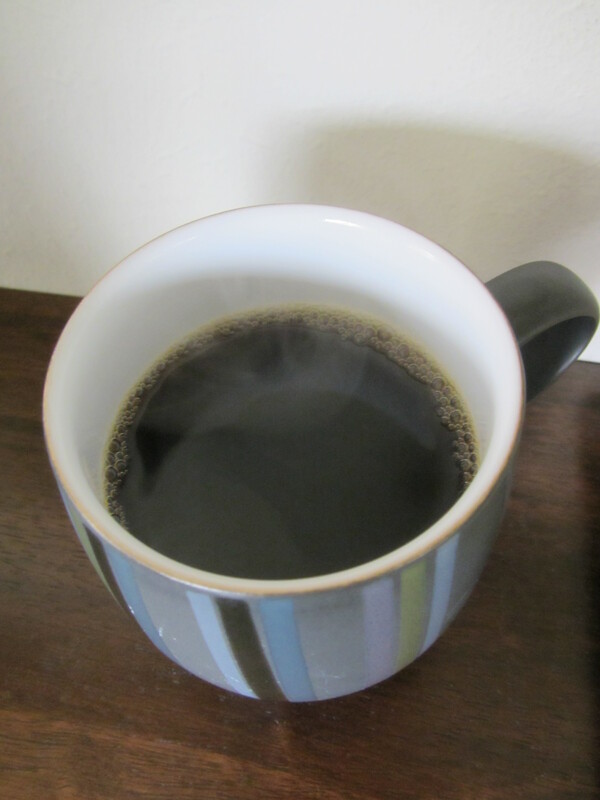 Since bitterness is a common complaint about coffee, many people assume they should decrease the amount of coffee to decrease bitterness. 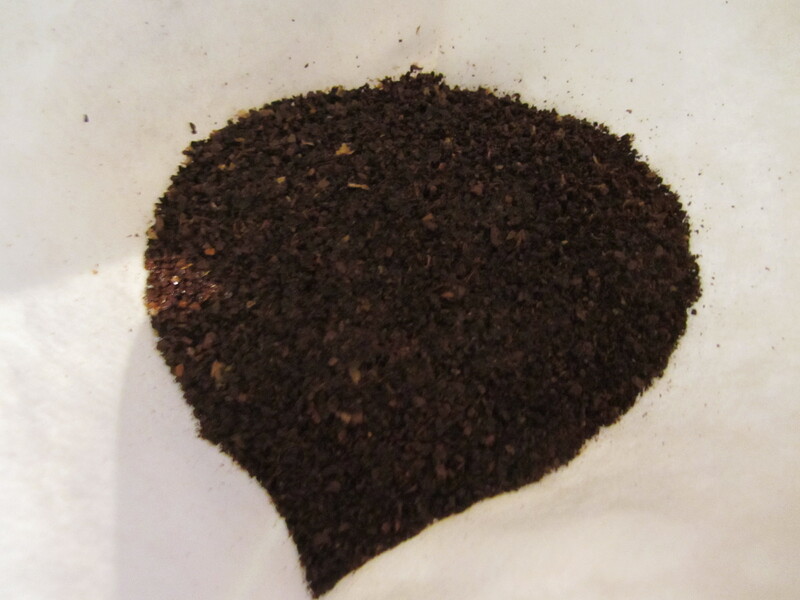 Instead, Alton stresses that it is necessary to use a good 2 T of coffee grounds per 6 oz. of water. 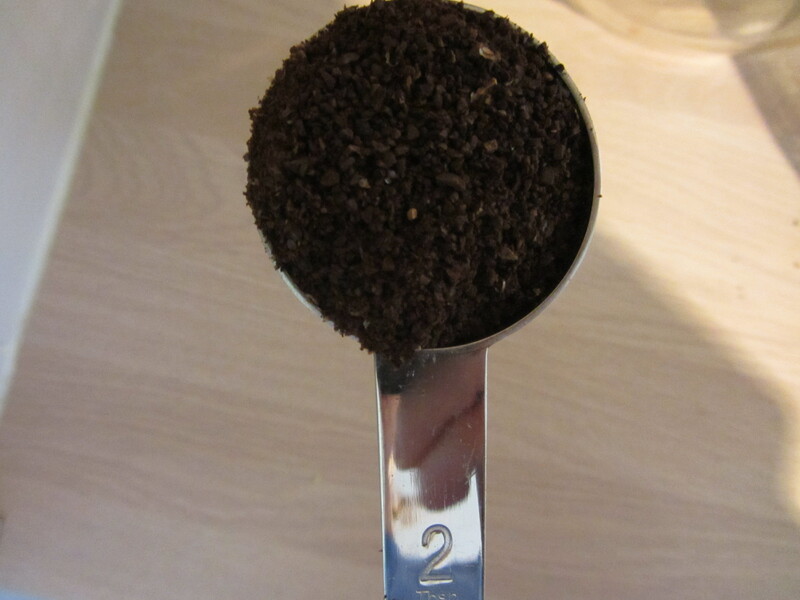 Using less than 2 T of coffee per cup leads to over-extraction and resulting bitterness. 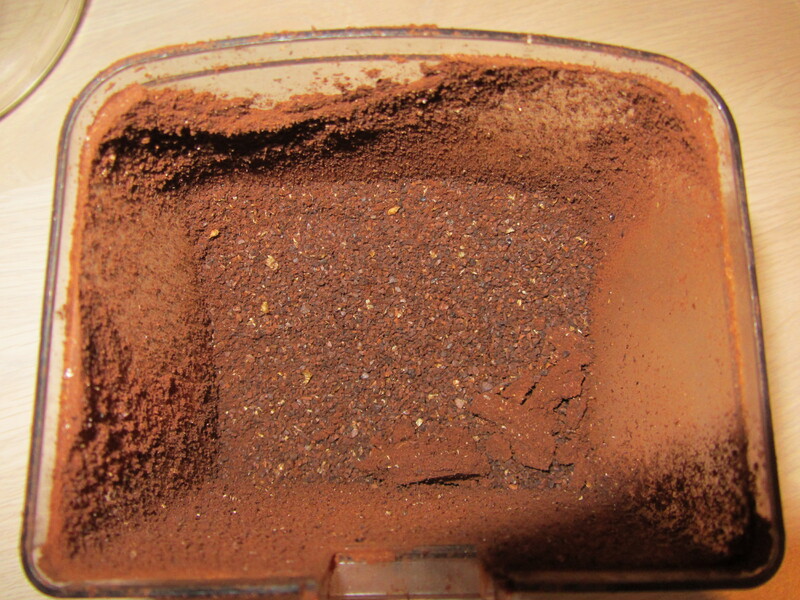 I set my burr grinder to the 6 cup mark, but it yielded less than the 12 T of grounds needed, so I had to grind more. 2 T per 6 oz. cup. Alton also mentions that water quality is important, as tap water can impart negative flavors. 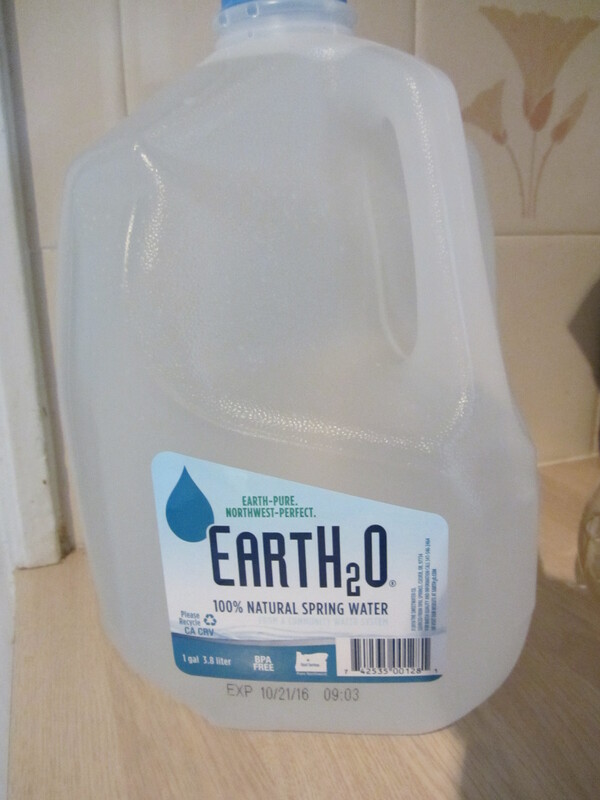 If possible, Alton says you should use filtered or bottled water. To go along with his method, I used bottled water. In addition to water quality, water temperature is pivotal, and you want your water to be between 190 and 205 degrees. To achieve proper water temperature, Alton recommends an electric kettle. 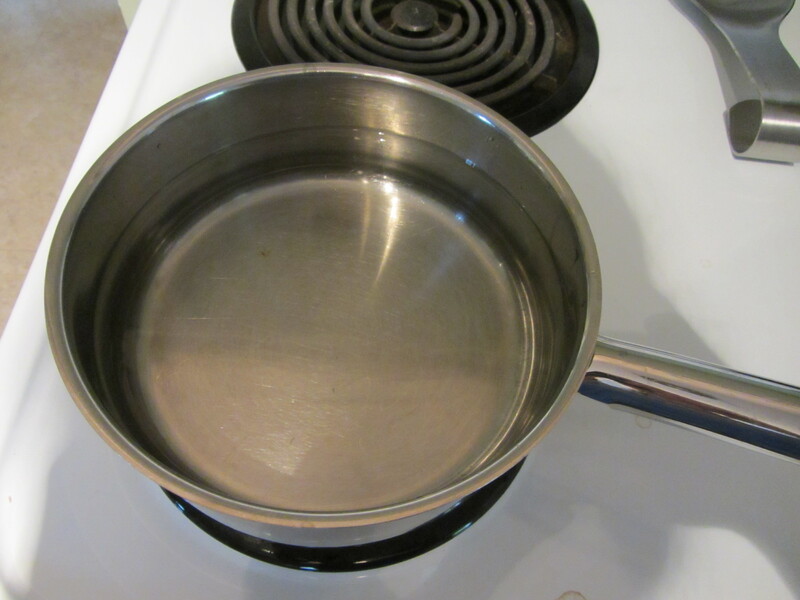 We do not have an electric kettle, so I brought my water to temperature on the stove. 36 oz. of bottled water, being brought to 190-205 degrees. 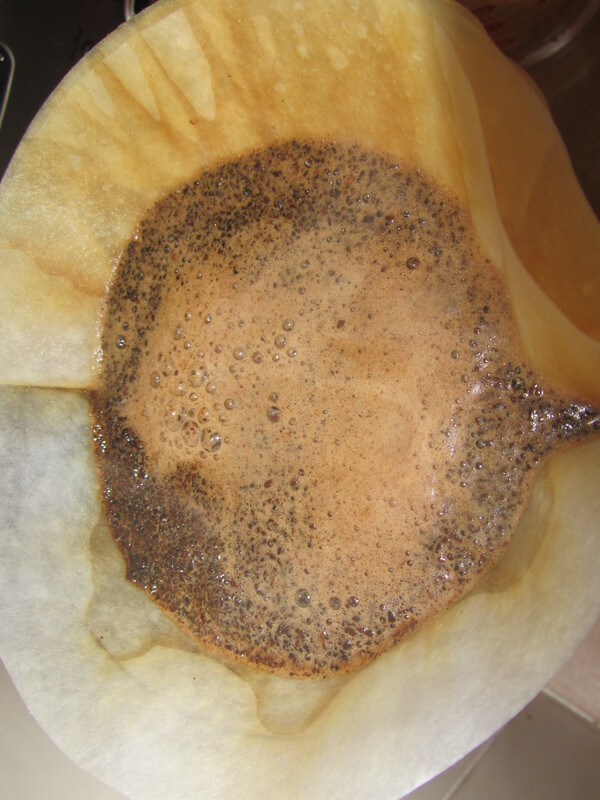 Ideally, you want to use a gold mesh coffee filter for extraction, which is placed over a thermal carafe. This maintains the water temperature. 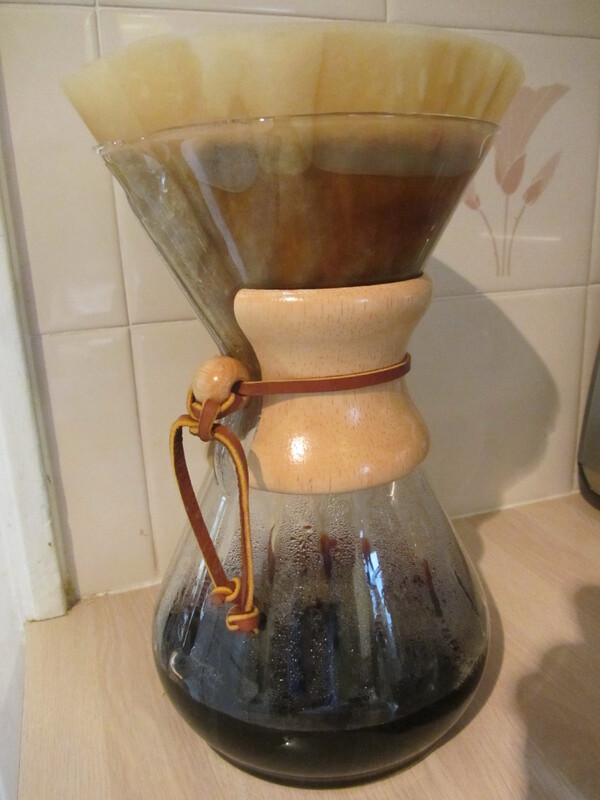 Since we don’t have a thermal carafe, I used my husband’s Chemex coffee maker and a paper filter. 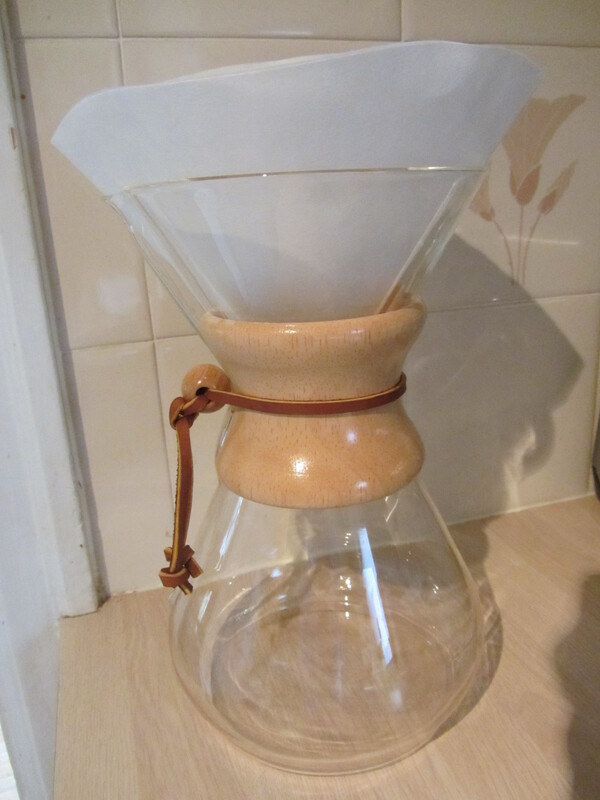 Chemex coffee maker with paper filter. 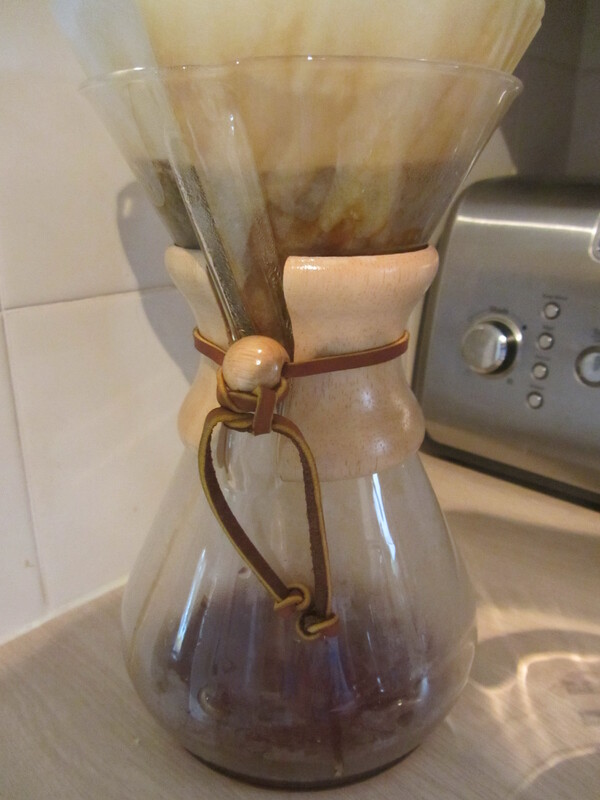 Before you pour your hot water over your coffee, it is best to spritz the surface of the coffee grounds with water. I used a spray bottle to spritz my grounds. Total extraction time for coffee should be between four and five minutes. My extraction took a little over five minutes, and about four pour overs. Finished brewing after about 5 minutes. A lovely cup of coffee. FYI, according to Alton, only about 30% of coffee is extractable (by weight), and only 2/3 of that extractable portion has pleasant flavor. I brewed my Alton coffee this morning, so my husband and I could drink the coffee at the same time. I will say that this coffee had no bitterness. I do usually add half and half to my coffee to cut down on bitterness, but I drank my cup black this morning; this may have had something to do with the fact that we purchased fat-free half and half by mistake (yuck!). My husband, the usual coffee brewer in our house, admitted that this coffee seemed less bitter than normal, and stated that he will be using 2 T of grounds per cup from here on. I highly doubt we will be using bottled water for our daily coffee brewing, but this method did result in a good cup of coffee. If you want to be guaranteed a great cup of coffee with no bitterness, give Alton’s method a try. The biggest takeaway message: use enough coffee grounds when brewing. 1) Buy beans in foil bags with a one-way valve. The valve allows CO2 from the beans to escape. 2) Store coffee in an airtight container at room temperature for a max of one week. 3) Do not freeze coffee. When freezing, condensation forms on the beans, which increases oxidation. 4) Decaf coffee is much more expensive than caffeinated coffee because the decaffeination process depletes much of the goodness within the coffee. Therefore, very high quality beans need to be used to produce acceptable decaf coffee.